This Personal Capital review is a 2019 update as we’ve been using the platform for four years. 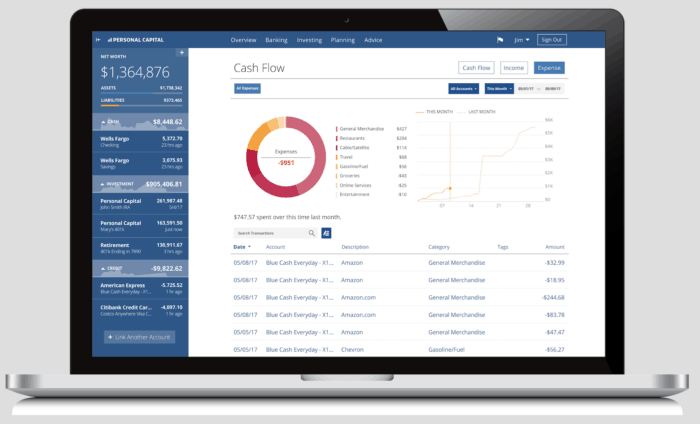 My wife and I are busy managing our business and want a way to streamline management of our finances. Personal Capital provides a great way to do exactly that. If you’ve not heard of Personal Capital before think of them as Mint with investing thrown into it. While I’ve been fine managing our various investment and financial accounts, I like to find ways to simplify my life and the service helps me do that. This Personal Capital review will help you determine if they’re a justifiable option to stay on top of your finances. Before I get into the review of Personal Capital, I’ll give a brief background on the company. Personal Capital is run by former PayPal and Intuit CEO Bill Harris. He was key in raising $28 million to start the company and many within the organization have obtained the Certified Financial Planner (CFP) designation. This is all done as a way to help you have one location to go to that tracks all of your finances. It also analyzes your investments to make sure you’re on track to reach your goals. The beauty of Personal Capital is you can set it up to manage as much or as little of your finances as you want. You can use it to simply track all of your spending and expenses. You can also use it to view all of your investments in one place – or you can do both of course. Who Can Use Personal Capital? The beauty is anyone can use Personal Capital. Anyone can open an account with Personal Capital and use its platform as it’s free! You may wonder how they make money and that is a valid question. Personal Capital makes money by offering financial advisory services to those with at least $25,000 in investable assets. Those clients have the option of being paired with a financial planner who will go over their investment needs. That’s not required by any means, but is a nice option to have. The key to remember is that these fees are on top to the fees you’d experience through being put into one of the investment funds. These are generally an ETF, so in some cases you might be looking in the neighborhood of one percent in expenses which is in the competitive range of investment management fees. Again, this is not required and you can use the platform without paying a dime if you wish. The Platform is free: Who doesn’t like free? I’ve used Personal Capital for four years now and has cost me nothing. You can’t argue with free. Fee analyzer: I love this feature of Personal Capital! 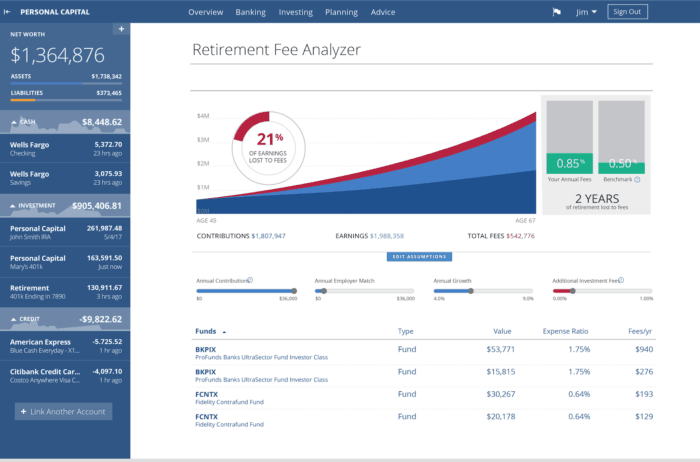 What this feature does is analyze the fees you’re paying in things like your 401(k) or mutual funds to help you see where exactly your money is going. As an aside, knowing how much your investments cost you is an incredibly important thing to know as it can be a significant drag on your overall portfolio. Easy to use App: I know this should be a given but not every app delivers on that. The Personal Capital app is different. It’s intuitive and easy to use on a variety of devices. I’ve used it both on an iPad as well as my Android based phone and it has done great on both. If security is a concern, Personal Capital requires a four digit code to be sent to you via either text or call to authorize the device. They also have an Apple Watch App, if that’s something you want. Investment checker: Do you know how your investment choices are comparing to their benchmarks? If you don’t, this is a great feature Personal Capital offers and is free to use. After connecting your investment accounts they tell you how your investments are allocated and how they’re performing against their benchmarks. The process of connecting your brokerage accounts took me less than ten minutes and was very simple and straightforward to follow. What this essentially breaks down to is an on-going free portfolio review. Additionally, Personal Capital doesn’t manage 401(k) or 529 Plans, but they can be included in this portfolio review. Personal Capital, manages over $8 billion in client assets and recently added the ability to invest in Socially Responsible Investing (SRI) funds. SRI is in more demand by investors, so it’s great to see this offered by advisors from Personal Capital. Asset allocation Target: Along the same lines as the fee planner and investment checker, Personal Capital analyzes your portfolio to make sure you’re not over or under invested in a particular sector. Free to send money: Through the Universal Checkbook feature Personal Capital allows you to send funds to anyone you wish or deposit funds directly into your personal banking account. I’ve not used the feature myself, yet, but they have easy to follow instructions to get it set up. Reminders: I don’t know about you, but life is hectic. It’s easy to forget things. Personal Capital allows you to set reminders so you’re notified when bills are due or sent and even updates to your net worth. 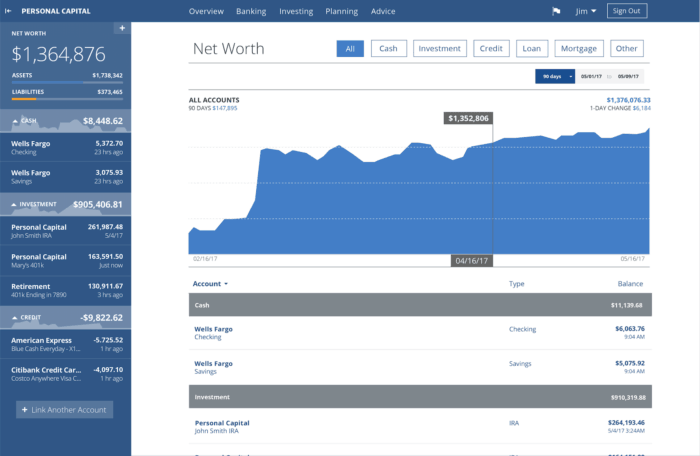 Net Worth tracker: As Personal Capital allows you to connect assets as well as loans, mortgages and credit cards, you can monitor your net worth. It also tracks your net worth and you can get reminders of when it’s updated. I didn’t connect everything, but did connect our bank accounts and mortgage which, like the investment checker was simple to follow. Investment education: As we’ve stated in many of our online brokerage reviews, education is key and Personal Capital doesn’t fall short here. They offer numerous free investment courses on their site to help you start investing in the stock market. I haven’t used the education myself, but they stand up against what you’d find at any online brokerage. Tax Analyzer: Personal Capital will not help you with your taxes but they will help you analyze ways to lower your overall taxable liability through tools like tax loss harvesting. This is an incredibly helpful tool to have if you’re in a need to reduce your tax responsibility. Retirement Planner: This is a newer tool added by Personal Capital. They look at your retirement assets to tell you if you’re on track to meet your retirement goals. Incredibly easy to use: Ok, this is not really a feature, per se, but I want to point it out. Having used the Personal Capital site over the past four years, I have found that it’s incredibly easy to use. Their graphs and charts are simple to understand as are most of the features on the site. Should you be concerned about security with Personal Capital? At first thought, I was a bit unsure of handing Personal Capital all of the login information to our bank and brokerage accounts. After researching their platform, those fears went away. Once I was fine handing over that information, the rest was a breeze. You can link any financially related accounts with as little as three clicks. From there they require you to be able to login to each account you’re linking as well as requiring login upon each visit to your Personal Capital account. What does this mean for you? It means you can link bank accounts, credit cards, brokerage accounts and more. Personal Capital uses a two-factor authentication system when you first sign up to use one of their free accounts. They first make you verify your password and identify the computer you’re using. If you try logging in from another computer, they send a notification to your email or phone to make sure it really is you. In short, they provide bank level 256-bit encryption security. In addition to that they can send you daily recaps of account activity in all of your accounts so you can stay on top of everything that is going on. Personal Capital encrypts all of your account information just like any other site with integrity would as well as having photo and password protection required. Personal Capital and Mint are two of the most popular financial software systems. Both are a great help to managing your finances, but many consider Personal Capital vs. Mint and don’t know which platform they should use. Both platforms are good, but each have their own specialty. When looking at Personal Capital vs. Mint, they’re not really competing platforms. You can use both to get a better picture of your finances. If you have a particular area of need, you can choose that platform and be fine. 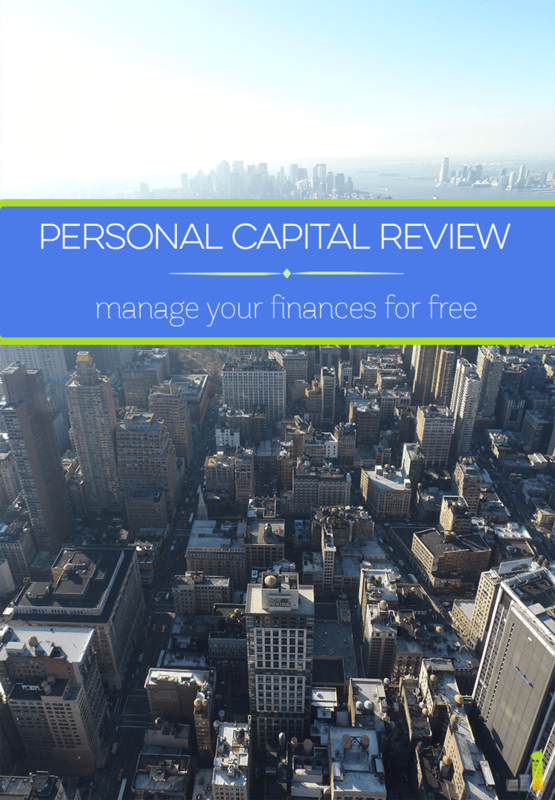 If you want a free tool to use to manage your finances Personal Capital is a good tool to use. In fact, it’s one of my favorite financial resources I use to manage our money. The platform allows you to co-mingle many of your financial accounts which enable you to have a snapshot view of how you’re doing financially. If you like to keep track of net worth or save time by getting a quick run down of where you stand then Personal Capital is a worthy consideration – especially considering that it’s free. The one knock against Personal Capital is the platform does not offer any budgeting help. In my opinion that doesn’t knock Personal Capital out of consideration as there are so many budgeting tools out there, like Mint, You Need A Budget, etc., and many of them are free. I will also add that I’d like to see them offer wealth management services to those with under $25,000 in assets. Many other robo-advisor firms offer that with much lower minimum balance requirements. That being said, I imagine you’d lose the free aspect so there has to be a balance. I think for the right person, using Personal Capital is a great option. They offer a free service that allows you to keep track of your investments and see what changes can help you. Beyond that, Personal Capital provides a great way to manage your finances holistically in order to help increase your net worth. If you want or need a financial advisor, they have trained advisers who are assigned to your account and they make it easy for you to sign up for a call or instant chat with an adviser from the site. When I signed up for my account, one reached out to me but it was not a service I took advantage of as I knew I’d not be paying for professional advice. Managing your finances is important, to say the least. There are many tools you can use to do that and you need to find the one that fits your needs most. 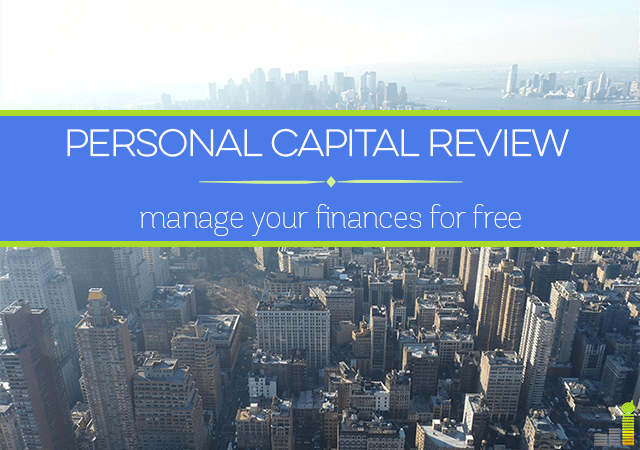 I’ve had a great experience using Personal Capital – even more so because it’s completely free to use! Do you use a service like this or Mint to help you co-mingle all of your financial data? If not, why not and if so what benefits do you get out of it? Thanks for the review. I’ve heard a lot about Personal Capital but was not very familiar with the services they offer. This was helpful. I am also a bit leery of the part about putting in all your bank passwords. Not a problem Dee. I had heard a lot about them as well and thought I’d give them a try. They do offer quite a bit of services to make things easier on you, especially if you have various accounts at different places. I was concerned somewhat as well with giving them that but they’ve got a lot in place to protect you as a client. It was about time that someone extended the brilliance of Mint to the investing sector. I’ll have to look seriously into incorporating this application into my investing regimen. I agree Tom! It is a pretty sweet setup to use, especially if you have various accounts all over the place. I’m actually in the process of writing a Personal Capital review as well. I love the service and the interface. I prefer it over Mint now! Very cool! I’m the same way as well. After using Mint for years, I made the switch last month to Personal Capital. It is awesome! Though our 401s see our only investment right now,I am watching the net worth feature as I pay down debt. This app is the best freebie! most unusual and frankly,even suspicious, that anybody would consider it appropriate to ask for the information which would allow to log in to any bank or any financial institution’s account of the Personal Capital client. It is rather paradoxical that no employee of the bank I have been dealing with for decades is supposed to know or EVEN ASK, for a password,but the Personal Capital considers it appropriate to ask for such information. I was never considered to be paranoid but I believe that anybody who feels comfortable with giving this information is imprudent,to say the least. Furthermore,I can not think of any reason for which the Personal Capital would need this information,with the possible exception of their client wanted their financial advisor to actively manage his account(and it is my understanding that securing services of a financial advisor is not a prerequisite to obtain other,free services of this institution). Thanks for stopping by and for your feedback Gregory – I appreciate it. I can understand your feelings as I had them myself. I also worked in the financial services industry for 12-13 years so I can understand not wanting to hand the information over. That being said, the reason why they need the information is pretty straightforward – they’re providing a service which allows you to track your finances. Save for you manually inputting the information there is no other way to get the detail or depth of tracking they allow you to do. That’s also not to mention the fact that if they don’t have access to it then how can you really track it? They also have numerous procedures in place to make sure that when you’re trying to access your information they make sure it’s actually you. That helps mitigate the risk of someone else trying to get in and steal your info. You also have control over what accounts you provide them access to, which is a nice way to control what exactly of yours they can pull. To be completely transparent, how PC makes their money is by pairing clients up with financial advisors – but that’s only going to be offered to you if you have at least $100k in investible assets, though really beginning at the $250k point. It is by no means a requirement – I politely turned them down when offered to me, so I just went my way of continuing to use the free service. I’ve started using PC to solely track my investments. For some reason I like tracking my net worth manually every month with a spreadsheet. It’s a great resource for analyzing investments since it can tell you how much you may be losing to fees and if your allocation is appropriate. I agree, that’s a game changer, in my opinion, for those who don’t realize what they’re losing.